The Certified Lecturer’s Program is intended to recognize those brethren who prove themselves proficient in the principle lecture or lectures of the degree(s). The award consists of a bar, which is initially provided, and individual pins designating the degree or degrees in which proficiency has been made, which are attached to the bar. 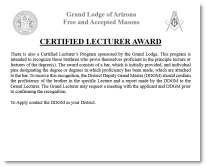 To receive this recognition, the District Deputy Grand Master (DDGM) should confirm the proficiency of the brother in the specific Lecture and a report made by the DDGM to the Grand Lecturer. The Grand Lecturer may request a meeting with the applicant and DDGM prior to confirming the recognition. 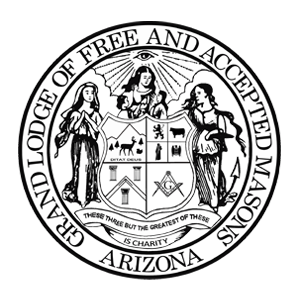 For more information or to submit for consideration contact the DDGM in your District.